The Firenze (as the Italianos would say) affair started after I gallivanted through the Milan Expo and was left with an extra day to explore this wondrous side of Italy. I headed to Milano Centrale as the sun was rising, bought myself a business class ticket (there were no economy seats available) and anxiously waited for the train to depart. Trenitalia's Frecciarossa, aka the fast train, was an extremely comfortable and swift experience. If one is commuting to Naples, Milan, Bologna, Florence or Rome, the Frecciarossa is their best method of transportation. Fashionably speaking, I had no business being in the business class cabin, but was certainly not complaining being surrounded by professionals in perfectly tailored suits. Bellissimo! When looking at the departure board, always look for the train number and final destination, in this case, Naples. Also, don’t confuse the departure board with the boarding board. One shows the departure city of the train, and the other one shows the destination of the train. I arrived in Florence to a chaotic scene - nonetheless, a beautiful one. I took the bus and headed to the city center. As I walked through the alleys, I found myself in front of one of the many gelaterias. 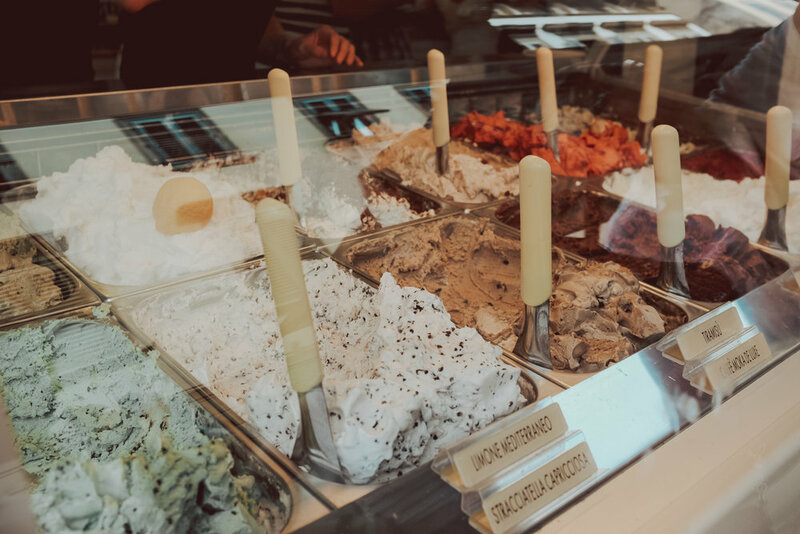 With the blazing weather, it's hard to resist gelato when you see it. I quickly made my way there and stared at the mouthwatering flavors deciding which one to try. After careful consideration, I ordered the Limone Mediterraneo.For an authentic gelateria experience, search for gelaterie that look low key, without any flashy plastic fruits on top or with out-of-season flavors. After a refreshing gelato, it was time for some real exploration. The Cathedral of Santa Maria del Fiore is the most iconic piece of architecture in Florence. Words cannot describe how massive and impressive the architecture and details of the cathedral is; visually stunning inside and out. Located in Piazza del Duomo, the cathedral is one of the three buildings in the plaza to form part of the UNESCO World Heritage Site. If your life goal is to visit all of the UNESCO sites, this would be one of them. Tip: To go inside, be prepared to queue for over an hour (Fast track for a fee) and be fit enough to climb 463 steps for an incredible 360-degree view of Florence. *Buy the ticket before queuing! The Giotto’s Bell Tower line is usually shorter, faster, and you get to see the Dome. Also, 49 steps less than the Dome. Sometimes, I find myself inadvertently starting at tourists' behaviors. I find amusing how they smile, take group pictures, selfies, or pose. It is fascinating to watch how different cultures from around the world merge in one single spot and react at such fantastic site. If you are lucky, you may find musicians playing while you stroll the plaza for a complete Italian experience. The second most visited plaza right after Piazza del Duomo; unsurprisingly, it is located near Piazza del Duomo and Ponte Vecchio. Piazza Della Signora served as the political hub of Florence. Falling into my own faux pas, I ate at one of the restaurants located in the plaza. The quality was questionable, the price was surprisingly moderate, but the view was great. Home of Michelangelo’s masterpiece, David, is a must visit in Florence. Although David is the star and main attraction of the museum, there are other great marble sculptures. While there are plenty of replicas of David all around the city, it may worth the time and money to visit the real thing. How to find the Galleria? Look for the hoard of people queueing. Book tickets in advance to skip the ticket line. Otherwise, prepare to spend countless hours in the summer waiting in line. Well, you can’t say Florence lacks piazza! Although the piazza is small, its filled with boutiques, coffee shops, restaurants, and bars that open until late. It has a great atmosphere and perfects to recharge, and people watch. 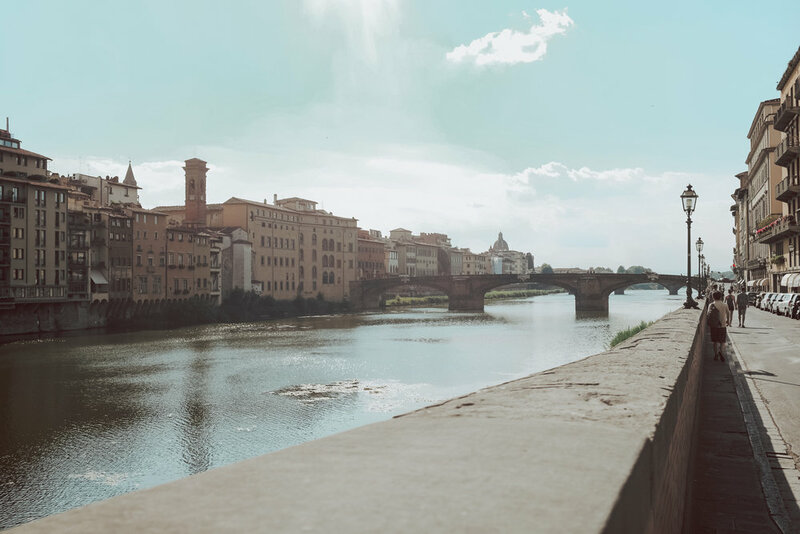 On your first visit to Florence, you cannot miss Ponte Vecchio. The bridge has shops built on it which are currently occupied by jewelry stores and souvenir shops. If you are a foodie like me, try food tours. Sometimes, they include entrance to these attractions skipping the long queues. 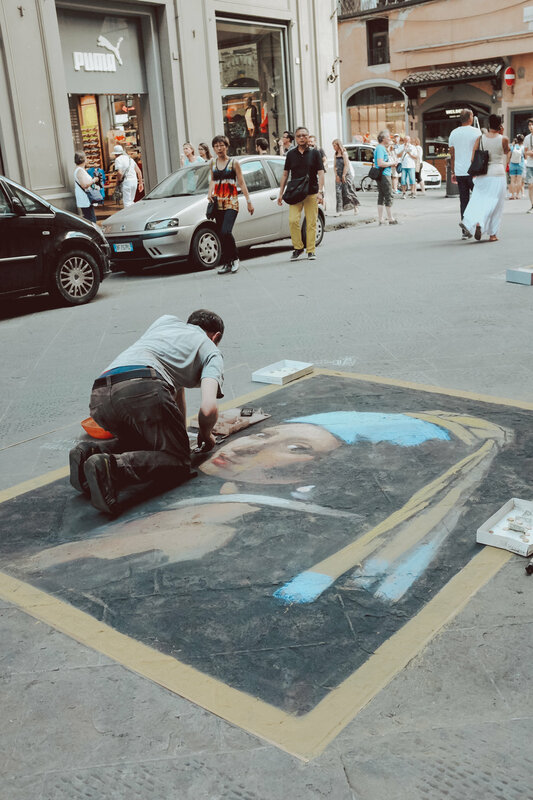 If you have a few days in Florence, try to visit all the touristy sites in a day or two and spend the rest roaming it like a local. The best way to explore a city and to learn its culture is by experiencing it like a local. It’s tough to avoid tourists in such a famous city but venture out, and you will find local gems. To get the best local feel of a town, search for bloggers that review restaurants or have deep insights of the city instead of planning your trip using Trip Advisor or any other ultra touristy sites. Although Yelp is a popular way to explore a city, is not very popular in some other places of the world making it hard to find local restaurants or shops. Have an extra day? Go on a day trip from Florence! Rent a car and explore the rolling hills of Chianti Tuscany.